According to Ayurveda each person is born with a unique body constitution, which includes the combination of thridoshas (vata, pitta kapha). Any physical or psychological problem is caused by the imbalance in thidoshas. Ayurvedic principles and treatments are based on the goal to achieve balance in thridoshas to address various physical and emotional health issues. Energy of Movement Vata represents the air principle in our body, and also represents the wind energy in the Universe. Vata is an energetic bio-energy. Vata or vayu is responsible for any type of movement and is the controller and motivator of all mechanisms in our body. Energy of Transformation Pitta represents the fire principle in our body. It also represents the solar energy in the Universe. Pitta is a thermogenic bio-energy. Pitta is responsible for production of heat. Any type of conversion or transformation in our body is carried out by pitta. 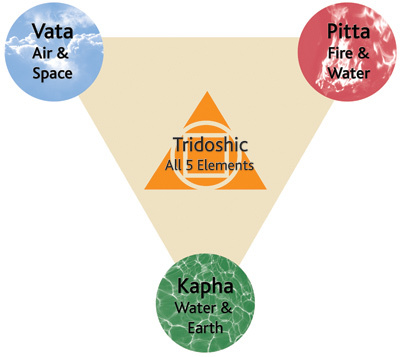 Energy of Cohesion Kapha represents the water principle in our body. It also represents the moon energy in the Universe. Kapha is a cohesive bio-energy. Kapha is responsible for bonding and support.